Thousands of visitors trickle through this stretch of Ocracoke Island every year. 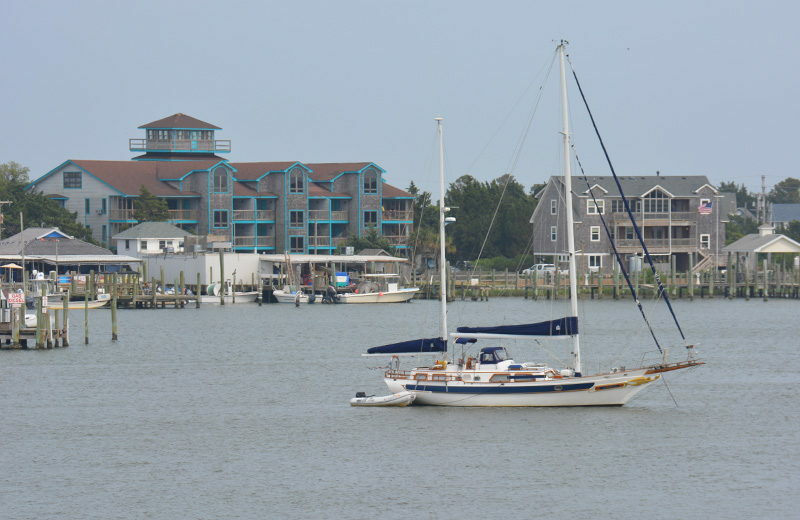 These vacationers are either en route to the North Carolina mainland or northern Outer Banks Islands via the Swan Quarter or Cedar Island ferries, or simply on "island time" and enjoying a day trip or even an extended week-long stay in this stunning coastal village. Boasting some of the Outer Banks' best and busiest sunsets, and featuring a wide array of attractions, businesses and activities around every pair of dock pilings, the Ocracoke Harbor is the heart of one of the Outer Banks' favorite coastal communities. Ocracoke Island, and specifically Ocracoke Harbor, was always a popular destination for travelers of all genres. As early as the 1530s and 1540s, European explorers would pass by the island or even become stuck on the shallow sandbars that were waiting just offshore. When this occurred, the mariners would hop ashore the island while awaiting repairs, and use it as an opportunity to explore and determine the possibility of future settlements. After several centuries of international recognition, the area was permanently settled in 1753, with the harbor serving as a focal point for which to build a village around. More visitors would pass through before and after its official settlement, however, even unwanted ones such as a rash of pirates that were brought to national infamy by Ocracoke's biggest fan, Edward Teach, better known as Blackbeard the Pirate. The pirate population was effectively wiped out by the early 1800s, when schooner specialists discovered the area and the ability of a skilled captain to use the Ocracoke Inlet and the bordering Pamlico Sound as a channel to the mainland. As a result, Ocracoke Harbor became a busy port, with goods being loaded and unloaded off the docks, on its way to East Coast residents. Even warehouses were built along the coastline to provide extra space, and the population had exploded by the early-1800s to a whopping 150 residents. As more easier-to-navigate ports opened up along the North Carolina coastline, however, Ocracoke Harbor lost its prominence and the shipping industry had all but disappeared by the turn of the 20th century. The United States Lifesaving Service, which patrolled the beaches and manned the harbor front Ocracoke Island lighthouse, provided some business for locals, but it wasn't until the mid-1900s and beyond that tourism began to grow, and the village would bustle once again. Small shops, restaurants, a general store, and charter businesses popped up all around the docks, and today vacationers come from miles around to experience Ocracoke's small-town charm and rustic, indigenous character that has remained intact throughout the centuries. The small Silver Lake is usually crawling with boats, skiffs, sailboats, yachts, and ships, from the giant North Carolina state-run ferries that make regular runs along its perimeters to countless privately owned vessels just popping in for a tour or even an elongated stay. 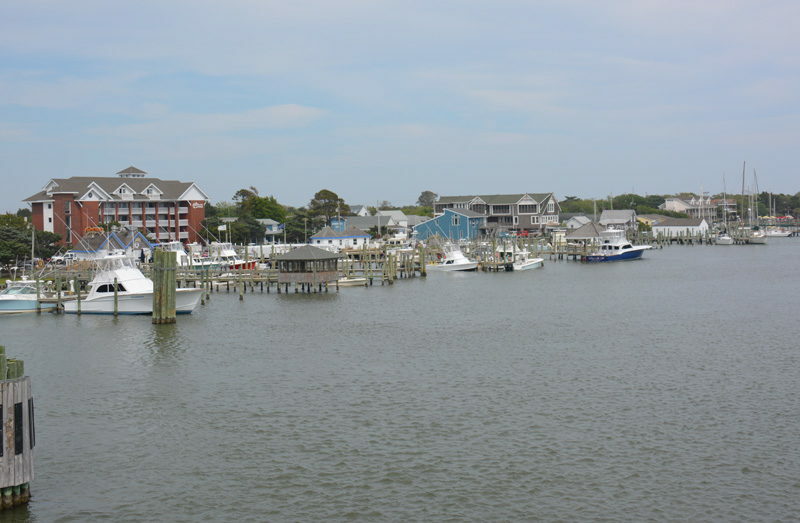 The harbor is bordered by bulk headed docks, small, privately owned rental cottages, and a stretch of NC Highway 12 that runs all the way through town, in a semi-circle around the harbor, and ends at the NC Ferry docks. While there are small soundfront beaches and patches of maritime forest located at either end of Silver Lake, the majority of the harbor front is well-populated with boats and businesses, all taking advantage of the simply incredible Pamlico Sound sunsets and Ocracoke Inlet access. Day trippers to Ocracoke Island could bypass the fantastic beaches and spend an entire day and evening simply walking around the harbor front, and enjoy a full day of entertainment. The stretch of waterfront that borders the harbor is filled with a number of shops, restaurants, and businesses. Avid shoppers can stroll the small grounds bordering the harbor, and pop into local art galleries, watersport and surf shops, chic boutiques, and even one of the island's oldest general stores, that's loaded with everyday staples as well as local souvenirs. Visitors in the mood for an off-the-docks adventure will also discover a number of local tours, charter fishing businesses, and even kayak and boat rentals available right off the docks. Many local water-based touring, rental and fishing companies simply advertise right along the harbor, with small kiosks accepting reservations, or just captains waiting to take someone on board. If your crew books a water tour or a fishing excursion based out of Ocracoke Island, this is where you'll meet and launch for your adventure. Small stands are also set-up along the harbor perimeter, offering kayaks and bicycles for rent, ice cream, frozen lemonade, and a number of other spur-of-the-moment treats. Generally only open during the summer months, visitors who might be inspired to take a kayak cruise around the harbor, or are in the mood for an ice-cold treat during their harbor explorations, will be happy to find these small stands waiting around virtually every turn. In the small sections of the harbor which are not populated with bustling business activity, visitors will also notice small sections of picnic tables and benches, ideal for enjoying a long, leisurely view of the water. The Ocracoke harbor is truly People Watching, (or rather "boat watching"), at its finest, as hundreds of boats in all shapes and colors can cruise in and out of Silver Lake in a typical summer day. In addition, visitors who care to linger will also be treated to a up-close-and-personal views of some of the harbor's most prevalent wildlife, specially pelicans, herring gulls, and even cormorants, all of which stick close to the docks for any fishermen cast-offs. Vacationers who enjoy a glass of wine or a fresh seafood dinner while watching their ship come in will also want to make a stop at one of the harbor's waterfront restaurants. There are several options virtually hidden along NC Highway 12, covered with island-landscaped clusters of cedars, oaks and seasonally sub-tropical flowers, all of which feature breezy outdoor and indoor seating, as well as eclectic local menus. There are also two open-air restaurants located right on the Ocracoke Harbor docks, both of which feature extensive local lunch and dinner menus, ice cold drinks, and plenty of waterfront seating. In addition, both harbor front restaurants feature seasonal live music by local performers, so guests can simply sit back, relax, and enjoy the view. Newcomers to the Outer Banks will also want to swing by the Ocracoke Visitors Center, located adjacent to the Ocracoke ferry docks, and featuring a wide variety of pamphlets and catalogs on area attractions, as well as a small museum. Of course, the biggest attraction of Ocracoke Harbor and Silver Lake occurs every night and is free of charge to all visitors. The daily sunsets over the harbor are simply stunning, especially with the dozens of boats that inevitably return with every sunset to dock up for the night. Any Ocracoke visitor who plans to stay until nightfall is all but required to head to the harbor for one of the most gorgeous waterfront sunsets the Outer Banks has to offer. Visitors to Ocracoke, either by land or sea, will find plenty of accommodations located just steps away from Ocracoke Harbor's docks. Several small hotels serve as both accommodations and marinas, with passing mariners able to pull up right to the harbor and hop across the street to a cozy waterfront room. One even features a waterfront pool which allows guests to enjoy a cool swim while watching the activity of Silver Lake. Both larger hotels offer multiple levels of waterfront rooms as well as private balconies, allowing guests to just sit back and enjoy the scene. A handful of bed and breakfasts, small inns, and nightly or weekly villas can also be found nearby, with premier accommodations and exceptional services. A handful of these accommodations are arguably as old as the village itself, and have been welcoming guests to their dozen or so rooms for literally generations. Campers will even find a small Ocracoke village campground located just a street away from the water, and visitors who want to enjoy an extended Ocracoke Island stay will find a small number of vacation rentals, tucked away on the southern side of busy Silver Lake. These vacation rentals have private kitchens, cozy bedrooms, incredible waterfront access with boat docks or small sandy beaches, and wide porches ideal for evening sunsets. Folks who simply fall in love with the busy but relaxed Ocracoke Harbor will want to scope out the cottages and vacation rental homes available along the harbor front to make the most out of their next Outer Banks vacation. In fact, many vacation rental companies that serve Ocracoke Island even offer "harbor front" as a search criteria to make finding those Silver Lake homes even easier. Otherwise, simply call a vacation specialist at a local Ocracoke Island property management company for guidance on area rentals with the best waterfront locations. Bring your walking shoes. Ocracoke Harbor and Ocracoke Village in general is best explored on foot, as the shops, restaurants and other attractions are located literally right next to each other. The best way to take a self-guided tour of the harbor is to park at the very end of NC Highway 12, in the large public parking area close to the ferry entrance. This free parking lot almost always has spots available, and allows visitors to simply enjoy the afternoon exploring, without hunting for a much-coveted parking space in the village. If driving through Ocracoke Harbor along NC Highway 12, be sure and observe the 20 mph speed limit. Even in the shoulder seasons and off-seasons, Ocracoke Harbor is a hotbed of activity, and motorists need to be ever-aware of passing pedestrians, bicyclists, and even golf carts that are congregated in the area. Interested in a tour of Portsmouth Island, a dolphin cruise, or a full day of Gulf Stream fishing? Take a pause by one of the many harbor front kiosks that feature both local charter business information and reservation services. Many local businesses also post signs right along the docks with their rates, availability, and contact information. Be sure and load up on both the sunscreen and the bug spray. Although most essential during the prime summer months, the sun off of Silver Lake can cause sunburn just as quickly as a day at the local beach. Want to explore more shops and attractions? Take a detour down Howard Street, which veers off of NC Highway 12 and runs parallel to the village for a spell. This road is Ocracoke Island's oldest street, and as a result, is a historic collection of classic cottages, small residential gardens, and off-the-beaten-path shops. Covered under a canopy of oaks and cedars, this detour also provides Ocracoke visitors a little dose of much-appreciated shade in the summer months. Visiting Ocracoke Island by boat? Be sure and ask your accommodations provider for available boat slips for rent within the harbor for easy, off-the-docks access to the village's most popular waterfront areas. Ocracoke Harbor is the center of Ocracoke Village, and many locals and long-time visitors attest that a stroll around the harbor front is an ideal introduction to the culture and quirky character of Ocracoke Island. With dozens of shops, galleries, boutiques and restaurants to explore, coupled with Ocracoke Island's collection of waterfront tours and charter fishing businesses just waiting for patrons, this small section of waterfront packs a lot of punch when it comes to activities and attractions. Whether you're just passing through town, or on a long Ocracoke adventure, chances are your travels will lead you right through Ocracoke Harbor. The heart of this small Outer Banks island for centuries, Ocracoke Harbor offers a little something for everyone to enjoy, all while maintaining its coastal, laid-back attitude. What is the Ocracoke Harbor? The Ocracoke Harbor, or Silver Lake Harbor, is a pond-like parcel of saltwater that marks the entrance to the southern end of Ocracoke Island. It is bordered and protected by a semi-circle of land, (which is Ocracoke Village), and connects with Pamlico Sound and eventually Ocracoke Inlet. Where is the Ocracoke Harbor? The Ocracoke Harbor, also known as Silver Lake Harbor, is located on the southern end of Ocracoke Island, which in turn is one of the southernmost islands of North Carolina’s Outer Banks. It’s situated in the heart of Ocracoke Village, which grew over the centuries around the harbor. Why is the Ocracoke Harbor called Silver Lake Harbor? Both Ocracoke Harbor and Silver Lake Harbor are used by locals and visitors to describe the pond-like waters in the heart of Ocracoke Village. Originally known as “Cockle Creek,” the name simply morphed over the years as a nod to the village itself, as well as the calm and sun-drenched waters. Is Silver Lake Harbor a Lake? Silver Lake Harbor is not a lake, but the area it refers to is a historic man-made harbor that connects with the Pamlico Sound and eventually Ocracoke Inlet, and which has served as a haven for vessels for hundreds of years. How do you get to Ocracoke Harbor? Visitors will need to take a ferry to reach Ocracoke Harbor and Ocracoke Island. Two ferries that depart from the mainland – the Cedar Island and Swan Quarter ferries – dock directly in the Ocracoke Harbor after a roughly 2.5 hour ride across the sound. The hour-long Hatteras / Ocracoke Island ferry accesses the northern end of Ocracoke Island, which is roughly 15 miles away from Ocracoke Harbor. Where can you dock at Ocracoke Harbor? 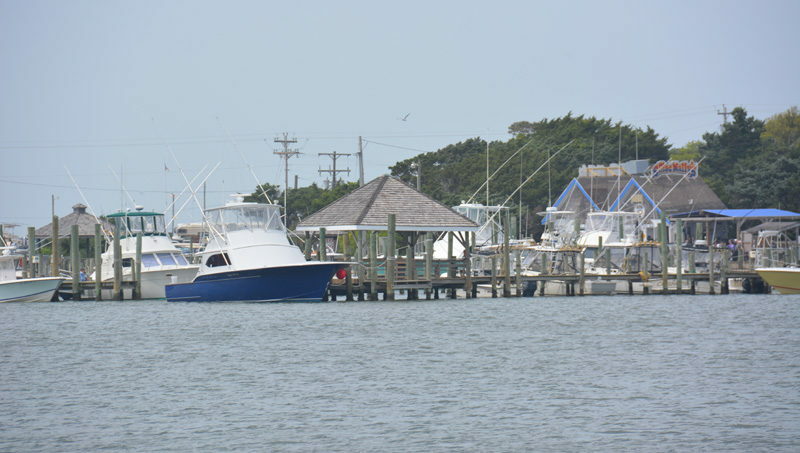 Visitors will find several marinas and transient boat slips throughout Ocracoke Harbor. With the exception of docks managed by the National Park Service, the majority of boat slips are privately owned, and are affiliated with local inns, tour companies, or restaurants. Are there boat slips for transient mariners at Ocracoke Harbor? There are boat slips for visiting mariners, which are generally privately owned and run by local marinas and inns. How far is Ocracoke Harbor from the beach? Ocracoke Harbor is roughly 1.5 miles away from the nearest beach access, which is next to the tiny Ocracoke Island Airport. A 4WD accessible ramp to the beach is also found a little more than a mile away, although a beach driving permit from the National Park Service is required to drive on the island’s shorelines. How far is Ocracoke Harbor from Ocracoke Village? Ocracoke Harbor is actually in the heart of the village, and the community of Ocracoke grew up around the lake-like parcel of water in the center of town. Are there waterfront restaurants on Ocracoke Harbor? Ocracoke Harbor has roughly a half dozen restaurants that are either directly on the water’s edge, or which are just a shell’s throw away, and which may offer waterfront views. What are the attractions at Ocracoke Harbor? Ocracoke Harbor is considered the heart of the action in Ocracoke village, and the harbor’s borders are home to a number of boat tour companies, charter fishing vessels, watersports shops, the Ocracoke Preservation Society Museum, the Ocracoke Visitors Center, and a number of galleries, stores and restaurants. Can you kayak in Ocracoke Harbor? Visitors are welcome to kayak in Ocracoke (or Silver Lake) Harbor, and hourly kayak rentals are often available along the water’s edge in the summertime. Paddlers will just want to watch for vessels of all sizes cruising in and out of the harbor throughout the day. Can you stand-up paddle board in Ocracoke Harbor? Stand-up paddle board rentals are available from several businesses on the edge of Ocracoke Harbor in the summer months. Watersports fans will want to watch for maritime traffic, which can be thick, and should note that the harbor stays fairly deep throughout, which may make it tricky for beginners. Can you swim in Ocracoke Harbor? Swimming is highly discouraged in Ocracoke (or Silver Lake) Harbor, due to the deep waters, heavy maritime traffic, and natural and manmade debris within the waters. Can you take a boat tour of Ocracoke Harbor? There are a number of boat tours that launch from Ocracoke Harbor, and which explore the harbor itself, as well as surrounding landmarks and destinations, like Portsmouth Island. Tour information is generally available at the docks that surround the harbor. Is there a lighthouse on Ocracoke Harbor? There is not a lighthouse directly on the harbor, but the 1823 Ocracoke Island Lighthouse – which is the oldest operating lighthouse in the state – is situated just a street or two away, and is visible throughout the harborfront areas. Where can you stay near Ocracoke Harbor? 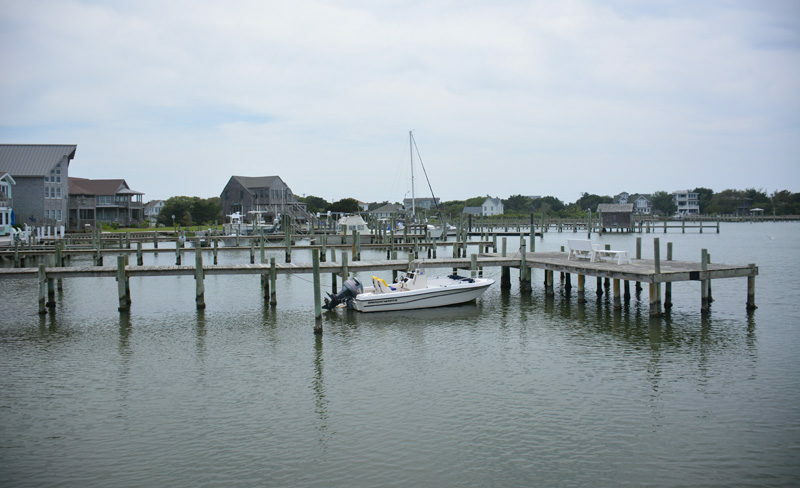 There are a number of inns, hotels, and bed and breakfasts that border Ocracoke Harbor. There’s also a campground just off the water’s edge, as well as many vacation rentals that are either on the harbor or which border the Pamlico Sound. Do the Ocracoke ferries depart from Ocracoke Harbor? There are two Ocracoke ferries that depart from the harbor – the ferry to Swan Quarter, and the ferry to Cedar Island, which are both communities on mainland North Carolina. Is there a Visitors Center at Ocracoke Harbor? The Ocracoke Island Visitors Center is located on the northern edge of the Ocracoke (or Silver Lake) Harbor, and is situated next to the southern Ocracoke ferry docks. Where can you catch a sunset at Ocracoke Harbor? Visitors can find a seat at a waterfront restaurant or pub to enjoy an Ocracoke Harbor sunset, or can just relax at one of the waterfront benches that line the harbor’s edge. Why is Ocracoke Harbor important? Ocracoke Harbor helped to build this small community that has been populated since the 18th century. A popular spot for travelling mariners, the harbor was a place of commerce and community for hundreds of years. 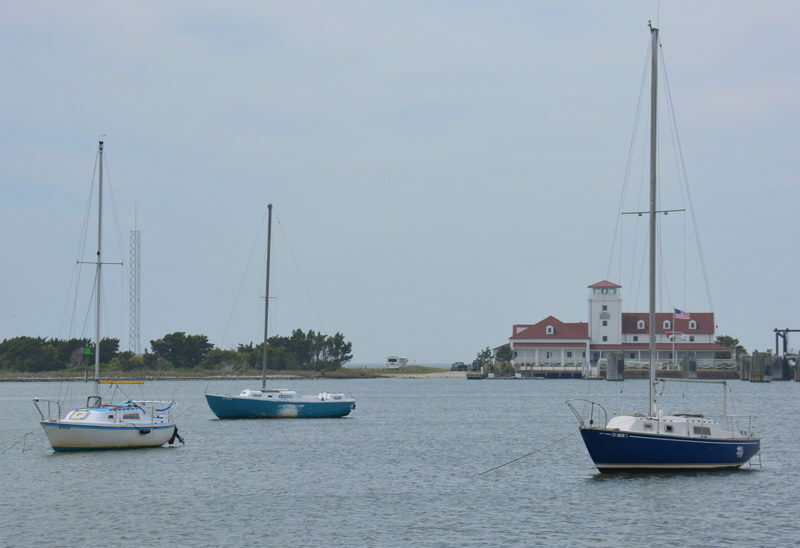 Today, Ocracoke Harbor still serves as the center of the village, with a number of restaurants, lodgings, marinas, and attractions situated along the water’s edge.